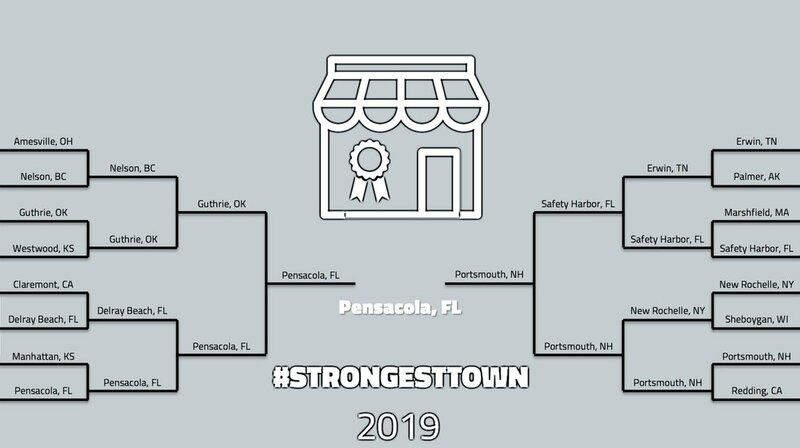 Thank you to all who participated in our 2019 fourth annual Strongest Town Contest. Each year, our members, listeners, and readers are invited to enter their town or city in this bracket-based competition designed to spotlight communities from around the world that are building enduring financial resilience at the local level and actively embodying the Strong Towns approach to economic growth and development. We selected our top 16 contenders, and through four rounds of competition kicking off on Monday, March 18th, you—our readers and listeners—got to vote on match-ups between these towns based on written submissions, photos, podcast interviews, and more! This year’s showdown for the championship took place on April 8th between Pensacola, Florida and Portsmouth, New Hampshire! Representatives of both towns appeared in a live webcast with Strong Towns Founder and President Chuck Marohn. In the final round voting, Pensacola edged out Portsmouth by a margin of 58% to 42%. Pensacola will receive a special visit by Chuck Marohn to celebrate their victory; a free Strong Towns presentation; and a detailed profile on our site later this year. Click here to read our post congratulating Pensacola on its victory. We conducted 15-minute interviews with representatives of each of the final four towns in the contest. They have been published on the Strong Towns Podcast and are also available to listen to on this page. Voting in Round 2 is now closed. It’s up to our readers to vote for their favorites each week. Voting is weighted so that Strong Towns member votes comprise 50% of the tally and non-member votes make up the other 50%. Only one vote per person per match-up! Please contact our Content Manager, Daniel Herriges, at daniel@strongtowns.org. Once our staff and board members select the strongest 16 entries, we'll publish their answers to our initial questionnaire on our website and invite everyone to vote between each of eight town match-ups. Based on your votes, we'll invite eight towns to move on to the next round and send us 5 photos with captions which illustrate the strength of your town. We will publish them along with commentary from Strong Towns member experts. Again, members and readers will have a chance to vote between town match-ups. In the Final Four round, we'll invite the winners of each match-up to come onto a special edition of the Strong Towns podcast to make their case for why theirs is the strongest town. We'll publish these podcasts and invite our audience to listen and vote in two final match-ups. As the culmination of our Strongest Town contest, we'll invite the top two towns onto a live webcast to debate and discuss the strength of their towns. Our audience will vote between these two and we'll declare the winner on April 12. One of 2017’s match-ups: Ellsworth, ME vs. Traverse City, MI. Monday, February 11: Applications released. Sunday, March 10: Town nominations due by 11 pm CDT. Monday, March 18 and Tuesday, March 19: The 16 contenders’ submissions are published, and Strong Towns readers vote for the strongest. Thursday, March 21: Voting closes at 12 pm CDT. Top 8 contenders will be notified and asked to each submit a series of photos illustrating their town’s strength. Monday, March 25: Top 8 photo submissions are published, and Strong Towns readers vote for the strongest. Thursday, March 28: Voting closes at 12 pm CDT. Final four contenders will be notified and interviewed for podcast episodes. Tuesday, April 2: Final four podcasts published, and Strong Towns readers vote for the strongest. Friday, April 5: Final four voting closes at 12pm CDT. The top 2 championship competitors will be notified. Monday, April 8: The Championship Round is announced and a live webinar takes place with representatives of the final two. Strong Towns readers vote for the champion. Thursday, April 11: Championship voting closes at 12pm CDT. Friday, April 12: The winner is announced! Thank You to Our Contest Sponsors! A special thank you to our sponsors for their generosity in supporting the 2019 Strongest Town Contest. Click on each logo to be directed to that sponsor’s website. Applications are now open for #StrongestTown 2019.